I have a fascination with old abandoned buildings right now. Heading to Central Oregon to visit family gave me a perfect chance to hit a few spots that I have been wanting to photograph. 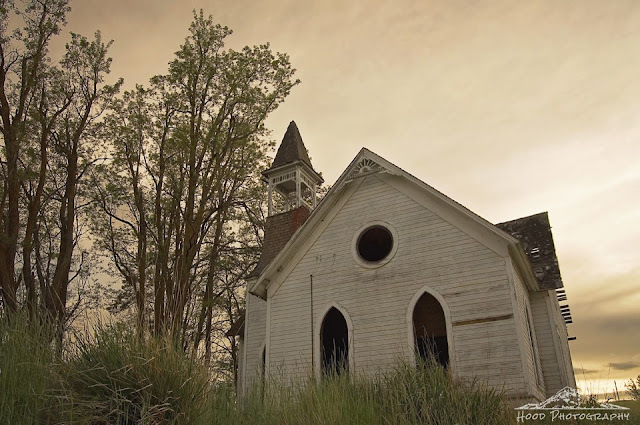 On the bucket list was the old Grass Valley Methodist Church. The church was built sometime around 1880 according to some sources I found online, and services were held until about 1946. I stopped by and captured its pretty face backed by the golden hour light. Beautiful lighting in this photo Sarah. That;s quite spooky, very atmospheric light. Abandoned building are great subjects for photography. ohhh, this is hauntingly beautiful. Fantastic composition and perspective. I absolutely love the composition and coloring in this photo. Beautiful!